These days, employees expect to have an office chair that’s height adjustable. It’s the industry standard since it makes so much sense ergonomically. However, even employers who recognize that employees have different requirements for seating don’t always realize that the same thing applies to worksurfaces. What’s the Problem with Normal Desks? A desk that is too high or too low can cause discomfort and promote musculoskeletal problems over time. An improperly positioned worksurface can make a worker’s arms rest at an uncomfortable angle on the desk edge when operating a mouse or keyboard. A surface that is set too low may prompt taller workers to slump. Employees may adjust their chair height to compensate a little. But then they can end up putting too much pressure on the backs of their thighs and interfering with leg circulation. 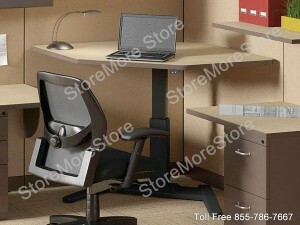 A real solution is one that lets workers adjust their desk work surface height as easily as they do their task chair. At StoreMoreStore, we keep our eye out for ways to help employers be ADA compliant. 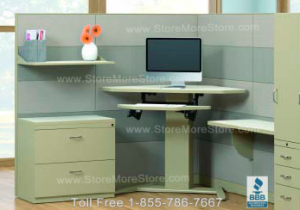 These Height Adjustable Workstations or work tables are a great option for employees with disabilities. The offset leg configuration means employees can roll or scoot up close to the worksurface with no obstruction on the sides. They can also quickly and easily adjust the desk to accommodate the height of their particular wheelchair or scooter model. 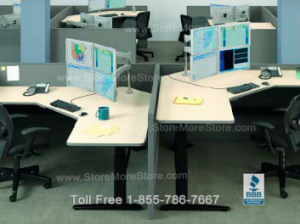 Flexible, Ergonomic, Green, ADA Compliant…what more could you ask for in an adjustable desk or workstation? 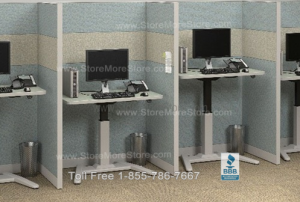 Visit StoreMoreStore for additional information on pricing on these height adjustable work stations that offer real solutions for your ever changing business, office, or school environment !